STILLEN G37 Grille Assembly INFINITI - Dezod Motorsports Inc - Home of the automotive performance enthusiast since 2002. 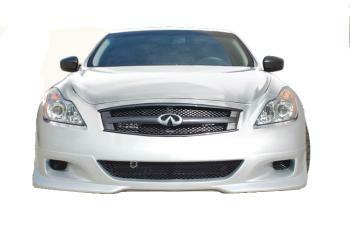 STILLEN is proud to offer a full replacement grille for the G37 coupe. Constructed out of high quality, durable poly-urethane this grille comes ready to install or ready for paint. With a matte black paint already applied to the grille it can be installed on any color vehicle and offer a great, aggressive look. Or, the urethane shell can easily and inexpensively be painted to match the factory color of the car. There are two available options for the finish of the grille insert material. The inserts come in either matte black or gloss black powder coat finishes. Either way the grille material is constructed out of very durable laser-cut steel with a high quality powder coat finish. The factory Infiniti Logo is reused from the stock grille.